How Much Did Obamacare Cost? Does Obamacare add to the U.S. debt or reduce it? The answers can be very confusing. Estimates ranged from saving $143 billion its first decade to adding $1.76 trillion to it. And then there's President Barack Obama's initial claim that the Patient Protection and Affordable Care Act would add increase the debt by $940 billion in its first 10 years. Who's right? They all are. Here's how. The non-partisan Congressional Budget Office said that the ACA would reduce the debt by $143 billion. It added up the costs of both of the laws that implemented Obamacare. The Patient Protection and Affordable Care Act (Public Law 111-148) detailed the plan. The Health Care and Education Reconciliation Act (Public Law 111-152) passed new Obamacare taxes and budget reductions in other areas, which offset the cost of the plan. Hospital insurance tax - $212 billion. Non-compliance tax - $64 billion. Cadillac health insurance tax - $32 billion. Medical device and insurers tax - $107 billion. Raising medical deduction limit to 10 percent - $104 billion. Reduce drug subsidies to the wealthy - $87 billion. Reduce hospital DSH payments - $37 billion. Reduce Medicare payments - $197 billion. Reduce Medicare Advantage payments - $135 billion. Service education loans directly. That eliminated the cost of the private loan servicer, Sallie Mae - $20 billion. When the costs of $940 billion were deducted, the deficit would have been reduced by $104 billion. This would have been added back to the deficit if Trump had repealed and replaced Obamacare. Expanding Medicaid and CHIP - $434 billion. Tax credits to small businesses who provide insurance - $40 billion. 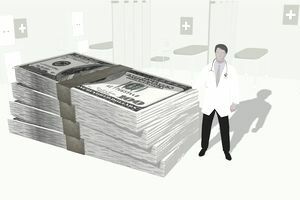 Setting up the health insurance exchanges - $358 billion. Tax credits for those who can't afford insurance - $106 billion. In March 2012, the CBO updated its Obamacare cost estimate to $1.76 trillion. The Senate Budget Committee Minority Office reported that this was two times more than the CBO's original estimate of $940 billion. Did the cost of Obamacare spiral out of control? Did Obamacare proponents deliberately mislead us? No and no. Expanding Medicaid and CHIP - $931 billion. Small business tax credits - $23 billion. Setting up exchanges and providing tax credits for those who can't afford insurance (combined) - $808 billion. In Depth: How the ACA Works | The Truth About Obamacare | How Much Will It Cost Me? | Why Reform Healthcare, Anyway? To save money on Obamacare, see my book The Ultimate Obamacare Handbook.